On the outside, Asher Davis appears to be a man who wants for little in his life. He's a highly successful lawyer whose reputation precedes him. When he wants something, he goes after it, knowing full well his perseverance will win out in the end. While handling a divorce case, he meets his client's soon-to-be ex-husband, plastic surgeon Drew Klein, and Ash is immediately hit with an attraction he's never experienced before. The opportunity to work side by side with the man at a medical and legal clinic he's set up for LGBTQA youth is one Ash knows he can't say no to, and it doesn't necessarily just have to do with him wanting to spend more time with Drew. However, Drew is very much straight and he's unsure how well someone like Ash would fit in at the clinic. Ash and Drew clash, but that underlying pull to one another is growing more and more difficult to ignore. But can two men in their thirties with trust issues, no thanks to Drew's cheating ex-wife and Ash's past in foster care, ever find love with each other? Learn more about Felice Stevens and Kale Williams. 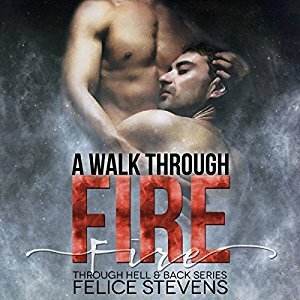 Purchase A Walk Through Fire on Audible | iTunes.